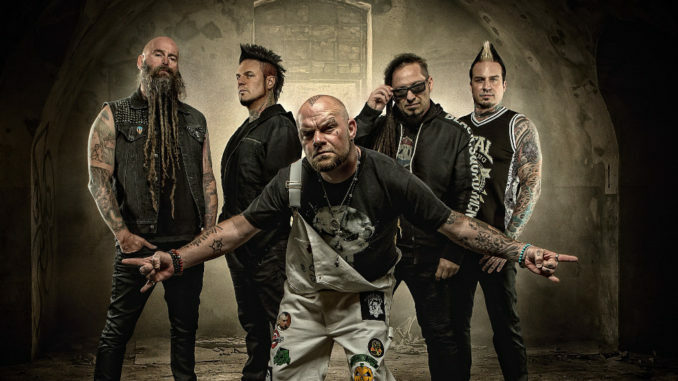 A rare voice of support in the entertainment world, FIVE FINGER DEATH PUNCH have been longtime supporters of veteran and law enforcement entities. Just this week the group again made good on this promise and donated a portion of the ticket sales from their massive summer North American Outdoor Amphitheater Tour equaling $95,000 to C.O.P.S – Concerns Of Police Survivors – whose mission is rebuilding shattered lives of survivors and co-workers affected by line of duty deaths, through partnerships with law enforcement and the community. Due to fan-demand, FIVE FINGER DEATH PUNCH and BREAKING BENJAMIN announced an expansion of this summer’s most-successful co-headlining North American Outdoor Amphitheater tour with additional dates that take both bands through Fall 2018 in Arenas. Co-produced by Live Nation and Frank Productions, the tour featured special guests Nothing More and Bad Wolves on the summer leg. On the Fall leg, global 2018 breakout rock band Bad Wolves will once again join the trek on select dates and Swedish heavyweights In Flames on other select shows. Chart toppers From Ashes To New will be support on all fall dates. The artists on the tour are also dominating the rock charts with their most current singles: Five Finger Death Punch at #1 last week with „Sham Pain„, Breaking Benjamin at #3 with „Torn In Two„, Nothing More at #8 with „Just Say When“, Bad Wolves at #9 with „Hear Me Now (feat. DIAMANTE)„, and From Ashes To New coming off a #2 hit. For tickets to the biggest rock event of the year, VIP offerings and more info, visit here and here. After a three-year wait, the multi-platinum group exploded onto the album charts earlier this summer with their seventh studio album AND JUSTICE FOR NONE, which is now the best-selling hard music album of 2018 and hit #1 chart positions in Germany, Austria and Switzerland. AND JUSTICE FOR NONE has generated 170 million U.S. on-demand streams and over 300,000 U.S. digital song sales. At 15 weeks, AND JUSTICE FOR NONE has surpassed all 2018 hard music albums that preceded it in terms of commercial volume–on-demand and programmed streams, digital song sales and album sales. In the U.S. alone, FIVE FINGER DEATH PUNCH have sold over 4.3 million albums, over 9.7 million digital songs and generated just under 2 billion streams. Eine seltene Stimme der Unterstützung in der Unterhaltungswelt, FIVE FINGER DEATH PUNCH, sind langjährige Unterstützer von Veteranen und Vollzugsbehörden. Erst diese Woche hat die Gruppe dieses Versprechen erneut erfüllt und einen Teil der Ticketverkäufe von ihrer riesigen nordamerikanischen Outdoor-Amphitheatre-Tour im Wert von 95.000 US-Dollar an COPS – Concerns Of Police Survivors – gespendet, deren Aufgabe es ist, zerstörte Leben von Überlebenden und Mitarbeitern wiederaufzubauen Opfer von Todesfällen durch Todesfälle, durch Partnerschaften mit Strafverfolgungsbehörden und der Gemeinschaft. Listen differently! Rethink! Now Vs Now: „The Buffering Cocoon“ Neu hören! Neu denken!